Better late than never! This project, from last year, took place at a very busy time, and photos never made it to the blog. A sweet family of four had an underused room at the front of their house and invited me over to brainstorm with them. 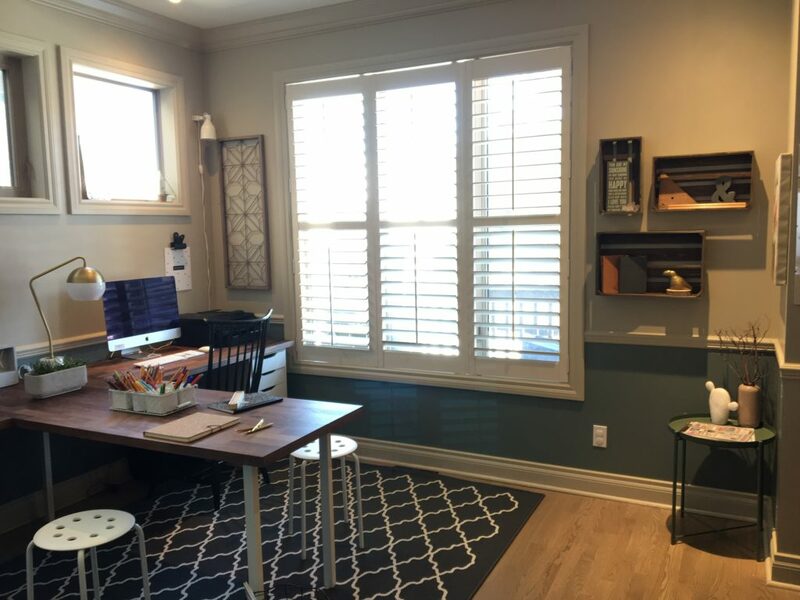 They weren’t sure what else to do with their piano, and although they wanted to create a new office space (they had been working in a dark spot in their basement) they weren’t sure how to create function. Adding to the complexity, the room is right at the from of their house which means it’s the first thing people see when they enter. It had to be as beautiful as it was functional. We decided to move the piano downstairs, which opened up more layout options. 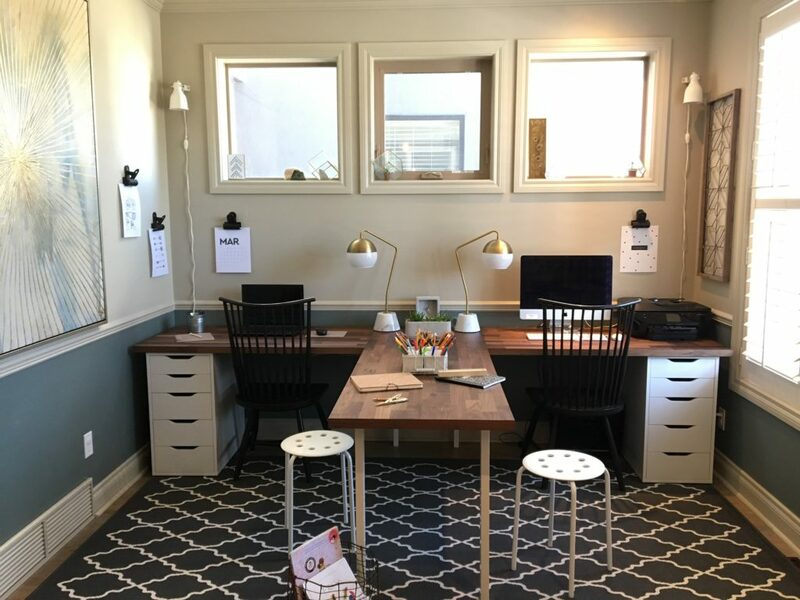 I suggested a T-shaped desk, in order to create his and hers workstations as well as an island for the kids to craft on, or do homework at as they grow. To make the most of the space, we used two IKEA butcher block countertops, and had my favourite contractor cut the longer one down the middle for us. As is, it was nearly a perfect fit for the length of the wall. We inserted the shorter countertop into to centre and bolted them together with steel plates. We used IKEA Alex drawers as outside legs, and white metal desk legs to support the centre and island. The depth of the counters and T-shape give him space to lay out plans and add extra monitors, as needed (he’s an engineer) and allow for the kids to join either parent while they’re working from home. 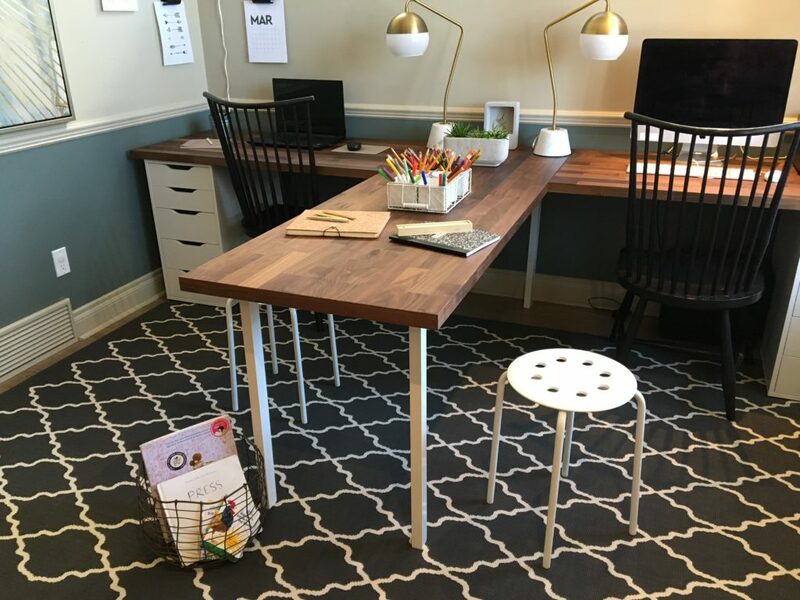 Low stools easily tuck right under the island top when the kids aren’t using them, and a table caddy keeps art supplies corralled and close at hand. 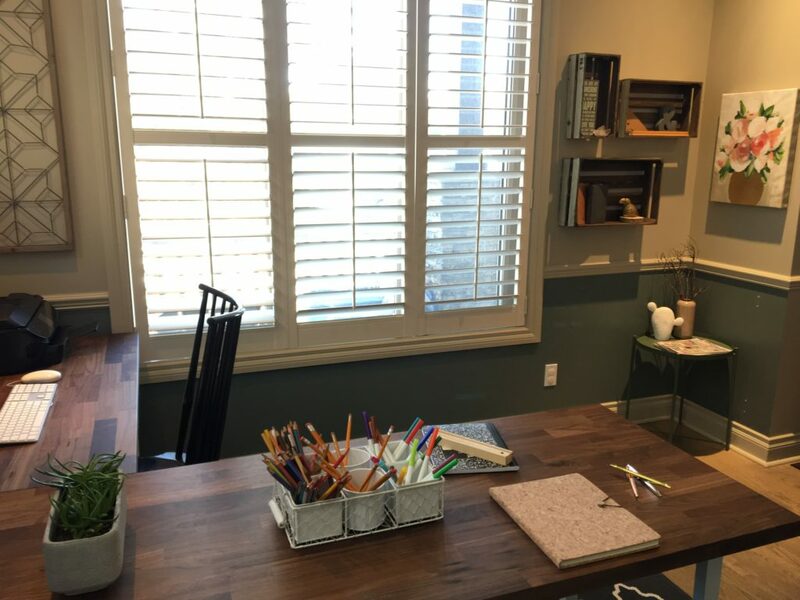 When discussing art options, the initial idea was for a command centre or gallery wall. 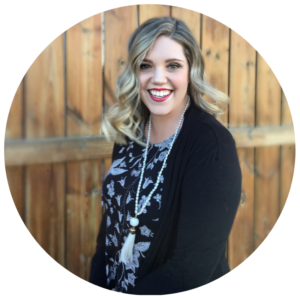 After getting to know them better, I learned that they both loathe clutter, and keep their home at near-showhome level of tidy. I knew that a command centre or gallery on such a focal point was likely to stress them out, and suggested a single large piece instead. They were keen on the idea and settled on this calm yet eye-catching piece. To satisfy the need for a calendar, or easy access to papers etc, we added some jumbo bulldog clips from Crate & Barrel. They offer lots of flexibility. 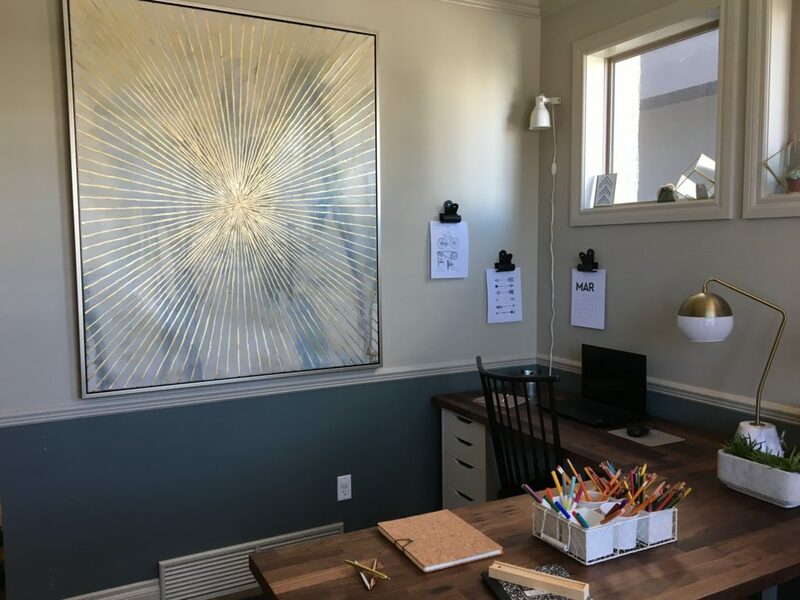 They can display fun art prints, keep bills or school forms handy or display a family photo in a range of sizes and change them out any time. 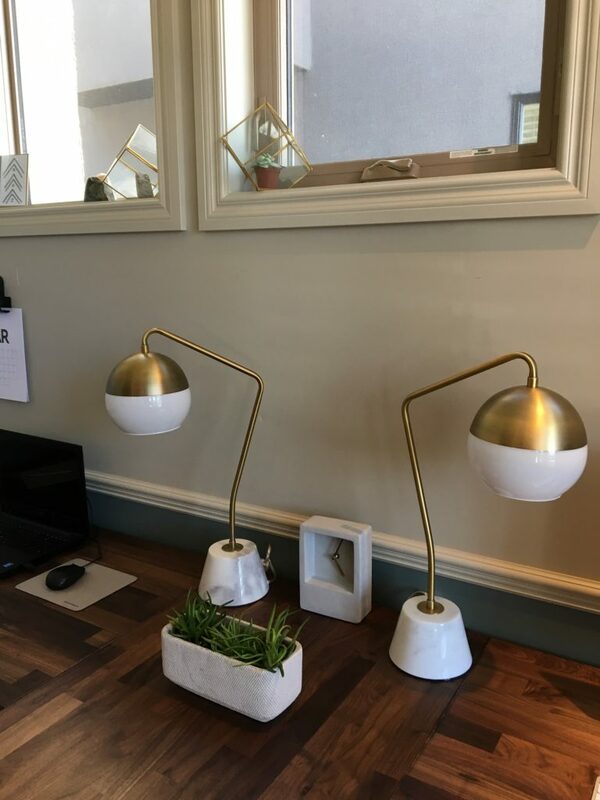 Two plug in wall sconces, and show stopping globe lamps offer a little extra light for evening work. A patterned rug finishes the space, gives some pattern and offers a soft place for little knees- because any parent that works from home knows that your little ones will play as close to you as possible! 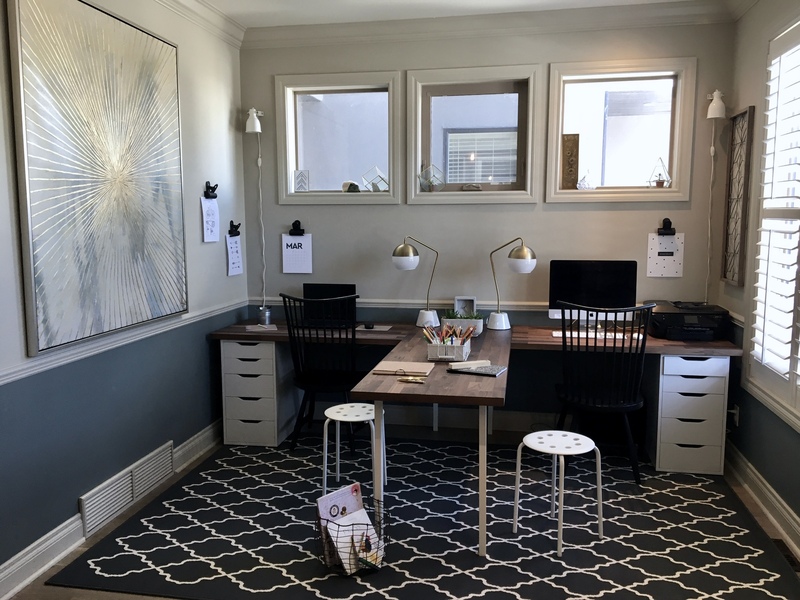 How wide is your room/ the desk to accommodate both work stations and the island?